The Medieval warrior cloak is the perfect costume piece for medieval themed weddings, Renaissance fairs, LARP events, and costume conventions. 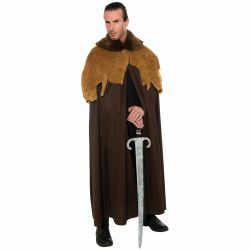 The cloak is colored as pictured and features long cloak trimmed with faux fur. Cloak is one size fits all.